The holy Temples and Monastries. Interaction with peoples from different ethnic groups and learn about their culture and traditions. Incredible views of more than 35 mountains of over 6000 meters. Mesmerizing waterfalls – Ganga Jamuna. Great views of Ganesh Himal Range, Manashlu, Langtang, Tibet Range, Great Himalayan Chain. Ganesh Himal Trekking area is one of the most isolated and least explored trekking area lies in the central region of Nepal. Recently this trail is getting famous but only the few foreigners have explored it in the past years. 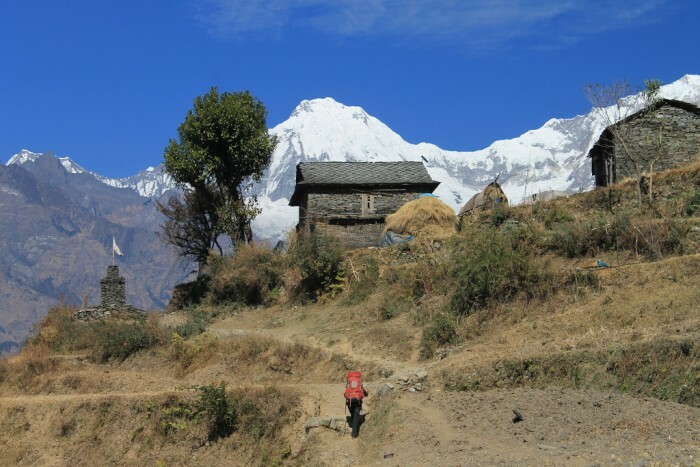 Ganesh Himal Trek offers the untouched natural splendor with wild and friendly inhabitations and range Peaks. This range offers the incredible views of many High snowcapped mountains like Ganesh I, Ganesh II, Ganesh III, Ganesh IV, Mount Manashlu, Tibet Range, Langtang and Annapurna. There are interesting panoramic views destination points on the trail, some of them are; Singala Pass, Jasail Kunda, Jyamrung, Kashi Gaon, and Khanchok etc. The trail offers the great views of more than 35 mountains over 6000 meters from sea level. The Ganesh Himal is named after the Hindu God ‘Ganesha – The Elephant Headed God’ of good fortune. The peak of Ganesh Himal look like the head of Elephant therefore it is popular as the name Ganesh Himal. The Ganesh Himal Trek is an exciting tour which lets you experience the beauty of vibrant villages, incredible mountains and glacier and spectacular landscapes. The peoples of different ethnic groups inhabits here, so the trail offers you the opportunity to observe the various ethnic groups and learn about their traditions and cultures. The surrounding views of Ganesh Himal is an enchanting memory that you will behold throughout your whole journey. Since the vegetation varies from sub-tropical to alpine during the journey, the trail is home to diversity of flora and faunas. Approximately 526 species of plants and 300 species of animals is counted in this region. The animals like Himalayan Thar, Gaur, Musk deers, monkeys and and many birds may be encountered on the journey. Ganesh Himal region is rich in Orchids, it possesses 40 different species of orchids. The great views of Rhododendron forests and waterfalls throughout the trail makes our journey more vibrant and lively. On the route, you can enjoy culturally enchanting homestay with the Tamangs. Now, get ready to relish this journey of adventure and full of breath stopping views of Great Himalayas with natural beauties. Pick up from Tribhuwan International Airport. Our assistance on your arrival and departure. TIMS (Trekkers Information Management System) permit. Accommodation in mountain lodges (if available) during the trek. 3 meals per day (Breakfast, Lunch and Dinner) during the trek. Porter (one porter for two guests). Any other expenses which are not mentioned in price include section. Welcome to Kathmandu – The Capital City of Nepal. Our representative will be there for your warm welcome and transfer to the Hotel. After short briefing at the hotel you will have leisure time for relaxing. Dinner in Kathmandu. Day 02: Kathmandu to Satdobato [1500m] – 7 hrs drive. We will start our journey early in the morning. Enjoying the great scenes of landscapes from the vehicle, we reach to Trisuli bazzar. Than we drive up to Satdobato via. Bumpy road. Satdobato includes mix culture of different ethnic groups like Brahmins, Chhetri, Tamang etc. Overnight stay in Satdobato. Day 03: Satdobato to Balche [1950m] – 5hrs walk. We start our walk early in the morning. Today is nice walk through terraces and villages, consisting Tamang and Dalit Peoples. We will observe the small monasteries of Buddhist peoples and The Hindu Temple on the bank of the river. Pilgrimage for both Buddhists and hindus stay unity in Nepal. Then, we continue gradual up to Balche village, where we spend our night today. It is an nice walk through the tamang village and some waterfalls on the way. Balche is a nice Tamang Village having the small school and governmental Health Post. Overnight stay in Balche. Day 04: Balche to Gonga [2900m] – 6 hrs walk. Leaving Balche behind, we walk through the jungle crossing the beautiful streams on the way. Now we approach to Thulochaur; a big beautiful ground lying on the middle forest. Where we may see some peoples living in the temporary huts, who looks after cattle’s and collect bamboo for making Baskets. Straining through the thick forest of beautiful Rhododendron and Pine and crossing the small springs, we will reach to Gonga. We may encounter the Himalayan Monkeys on the way to Gonga. Overnight stay in Gonga. Day 05: Gonga to Rupchet [3660m] – 4 hrs walk. We will enjoy the incredible views of Langtang and Tibet Range. Than we hike through the deep pine and beautiful Rhododendron forest. Today also we have the great chance to encounter mountain monkeys on the way. The walk is more difficult because of altitude and steep up. Late afternoon is free and easy, we can enjoy the great Himalayan charm of Tibet Range and gosaikunda range. Rupchet is the basecamp of Sing-la top and the highest altitude to sleep on our whole journey. We will stay here overnight. Day 06: Rupchet to Sing-La Pass [4200m] to Sertunga Kharka [2440m] – 6/7 hrs walk. We have to start our journey early in the morning to experience the sunrise view from the top of Sing-la. It takes almost two hours to approach, we mostly need to climb up. From here we can enjoy the great views of Ganesh Himal Range, Manashlu, Langtang and Tibet Range. After enjoying the scenario we will descend dpwn with the good view of Ganesh Himal range. We cross the Pine and Rhododendron forest and reach t the Sertunga Kharka. Today was the hardest day of our journey. We stay overnight at Sertunga Kharka. We cross the jungle on approx. 15 minutes than walk through the maize, barley, wheat fields. We can see the beautiful Ganesh himal throughout the day. We descend down to a remote village. Than walk to Sertunga village for overight stay. Day 08: Sertung village to Jharlang Phedi [1450m] – 6 hrs walk. After few hours easy walk and descending we approach to Borang Village – Tamang Village. From Borang village we head to Jharlang through the cultivated fields. Crossing the streams and enjoying the beautiful views of cultivated land and glancing Ganesh HImal we reach to Jharlang Village. Overnight stay here in Jharlang Phedi. Day 09: Jharlang to Kintang Phedi [1000m] – 6 hrs walk. We co0ntinue our walk through so0me ups and downs enjoying the great views of the mountains. We will walk through the small villages where the local folks greet us warmly. We will also pass through the cultivated lands. Then we will reach to the hot spring where we may take bath and proceed. Kintang valley is a small valley having mix cultures. Overnight stay in Kintang Phedi. Day 10: Kintang Phedi to Serabensi Jamrung [700m] – 6 hrs walk. Today is quite easier walk. We proceed through rice fields, some small villages with gradual ups and downs and mostly flat and easy walk following the netrawati river side. After some walk we reach to the shopping town of local peoples. Than we reach to Serabensi Jyamrunng. Overnight stay here. We cross the river by suspension bridge and take private vehicle to Kathmandu. The road to Dhadingbesi is bumpy and after reaching Malekhu we reach the highway and drive to Kathmandu. We will enjoy the scenic drive to Kathmandu. Overnight stay in Kathmandu. Our representative will drop you to0 the Tribhuwan International Airport before 3 hours of your scheduled flight and wishes your safe flight with the hope to see you again.